Merci Beaucoup for all the inspiration Tablescape bloggers! Next year I will be doing some TABLESCAPE INSPIRATION GIVEAWAYS... stay tuned... I will be ask YOU to send me the link to YOUR tablescape... and I will put ALL of YOUR names into a hat or French basket... or little miniature purse... ANYWAY... the WINNER will get THEIR tablescape painted and the ORIGINAL painting of it!!! Just one of the many GIVEAWAYS Fifi Flowers will be doing in the New Year... BE SURE to stop back EVERY Thursday!!! ENJOY YOUR day and go look at all the FABuLOUS tables via Between Naps on the Porch... they will INSPIRE you too!!! P.S. If you are purchasing gifts via My Etsy Shop... I can ship them to the person... and I can include a note from YOU... just leave a comment with your message and the shipping address. Happy Shopping!!! Don't forget to use the COUPON CODE: HOLIDAYSHOP15 for 15% off!!! sweetness, another wonderfully painted series!! Fifi we have a winner of our giveaway which you so graciously sponsored!! It is Patti Friday!! I have let her know and will have her contact you!! What a great idea! I agree BNOTP if fab and the inspiration you gleaned from some of my favorite Tablescapers is amazing. Lucky Tablescapers to have been chosen by you to be imortalized in your paintings. Oo la la, Fifi! THese are magnifique! 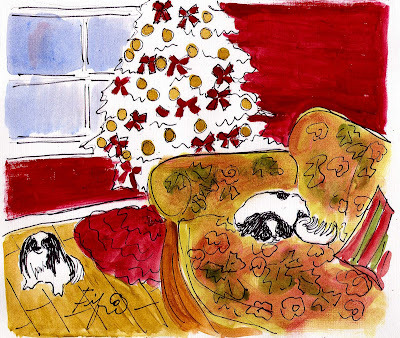 These would make delightful holiday touches, propped on an easel or on a sideboard. Merci! 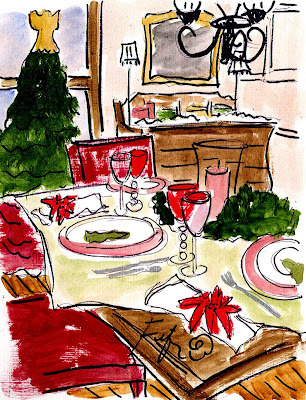 Beautiful tablescape scenes~ all the more with your creative hand! What a neat idea! I love the tablescape paintings. Have a beautiful day Fifi dear! 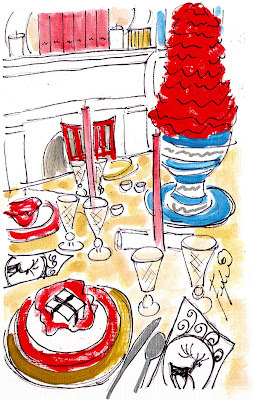 Fifi -- what an amazing honor to see my table in your painting. I'm utterly speachless. Thank you abundently. LOVE this series of paintings! So cheerful, bright and happy! Gorgeous! What a fun series! How fun & festive!! You are SOOO talented! I LOVE the style of your paintings. Thanks for sharing over at Susan's BNOTP! 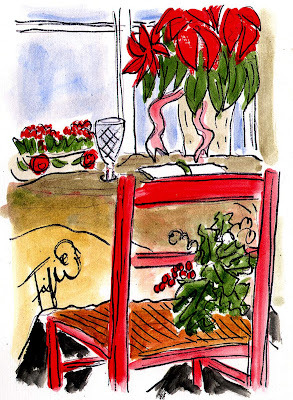 Love all your red paintings, so festive...Merry Christmas to you and yours! dogs in your paintings! I was thrilled to see my little Phantom come alive in your painting. How beautiful he and Caesar looked....Thank you so much!